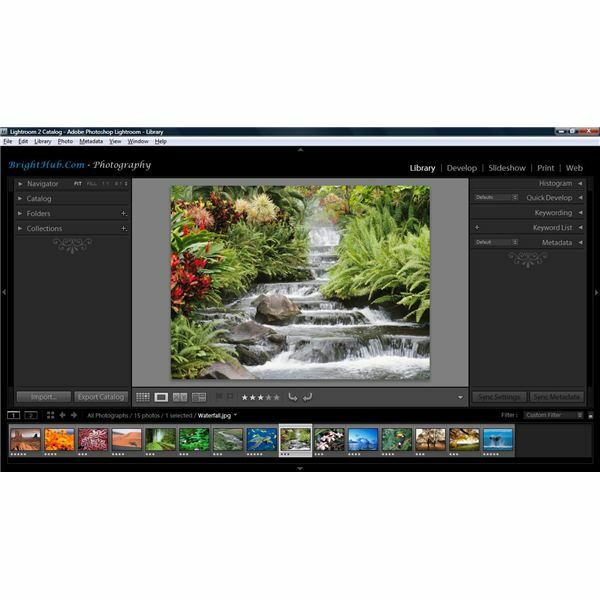 The Library Module within Adobe Lightroom is used to organize and view your photos. The photos can be organized based upon "Folders" and "Collections"
Quick Develop is a tool available within the Library Module in order to make minor changes to photos. More detailed changes can be made in the Develop Module. Keywords are used to tag and retrieve photos. Metadata is used to store additional information about the photos. All Photographs – This includes all the photographs in the catalog. Quick Collection (B) – This is used to create a collection on the fly. Previous Import – This refers to the most recently imported list of photos. Folders – This is used to Add Folders in the hard-disk which contain photos. The folders can be displayed based upon their folder names, their path (or both). The number to the right indicates the number of photos within a folder. Collections – Collections are similar to "Photo Albums". Click on the plus (+) icon in order to create a Collection. Adobe Lightroom automatically creates certain collections based upon Star Ratings (Use keys 1,2,3,4, 5) or Color Labels (Use keys 6,7,8,9). Collection Sets can also be created which are similar to a number of collections which are grouped together. Histogram – The histogram tool displays a histogram for the photo selected. It is best used to review the impact of changes made in the Quick Develop / Develop window. Apply "Saved Presets" such as Sepia, Aged Photo, Antique Grayscale, High or Low Contrast etc. The "Reset All" button can be used to erase all changes made and return the photo to its original stage. Keywording & Keyword List – Keywords are similar to "Tags" used on social networking websites and online photo storage websites. Can be used to describe the image present in the photo, the people in it, location etc. Keyword Sets can be created to group together similar keywords and to store frequently used keywords. Keyword Suggestions displays the most recently used keywords. Keyword List displays each keyword and the number of photos "tagged" with that keyword. Applying and removing keywords from photos is intuitive, and could be done via drag and drop, or manually typing into the keyword box. Selecting multiple photos and adding/removing common keywords is also possible. Metadata – Metadata is used to store and display additional information about the photos such as Title, Description, Date & Time of Capture, Name of the Creator, Copyright information, Dimensions, Technical Details etc. Navigator – Used to view the photos. Catalog – Refers to the entire catalog of photos. Folders – Shows the various folders within the catalog. Collections – Is similar to the concept of "Photo Albums"
Histogram – Displays a histogram. Quick Develop – Used to apply Saved Presets and modify Exposure, Tone Control, Clarity and Vibrance. Keywording & Keyword List – Used to "tag" photos with keywords. Metadata – Stores additional information about the photos.